Additing interactivity is about taking a DOM event and responding to it by doing something in the model layer and the view layer. Let's look at a few different kinds of interactions using Gmail as an example, and see how they might affect the state of the application (e.g. the model/view layers). Model data change. Here, the user interaction results in a model property being set. For example, in Gmail, click a message to star it. This might result in message.starred being set to true. Assuming that the view layer receives change events from the model, any views showing that message can then update themselves. Single view state change. Here, it is less clear which model is associated with the change. For example, in Gmail, click a collapsible section to show/hide it. This is naturally expressed as a property of the view instance. Multiple view state change. In this case, we want a single action to influence multiple views. 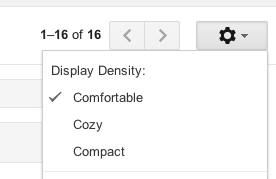 For example, in Gmail, change the compactness of the app display density. This will cause all views to adjust their display density, making them visually more compact. There are two ways this might be implemented: by sending a transient message to which all views react, or by having a setting in the global scope that all views poll/subscribe to. Page state transition. What makes page state transitions different from the others is that it involves a wholesale change in the page. Views might be destroyed or hidden, and new views swapped in place of them. For example, in Gmail, click on "Compose" to start writing a new message, which loads up the message editor. Listening to DOM events is all about the lifecycle of our view. We need to make sure that we attach the DOM listeners when the element containing the view is inserted into the DOM and removed when the element is removed. In essence, this requires that we delay event registration and make sure it each handler is attached (but only once), even if the view is updated and some elements within the view are discarded (along with their event handlers). Figuring out what action makes sense is part app programming, part framework capabilities. Whether we are using model-backed views or markup-driven views, we still want to make the most common operations simple to do by providing access to the related information. The rest is app-specific. Both of these are obviously just ways to call the DOM API to add event listeners to elements. The difference is that DOM-selector-based event bindings can be implemented much more simply. The framework-generated event bindings require that the framework generates selectors to attach the event bindings, and that the metadata for what events to listen to and what to do needs to be extracted out of the template into metadata or a view object. I find it fairly hilarious that we've basically come full circle: when JS launched, it began with onclick handlers inside HTML. Then people started hating on JS within HTML. And now, we're back to defining onclick handlers; except that now those onclick handlers actually get compiled into JS objects that represent the DOM that are managed by a framework. Of course, things are a bit different on this iteration: the patterns used are more sophisticated, we pass a custom scope to the event handler, the bindings for the onclick handlers are more intelligent, and binding/unbinding events is handled by the framework. There is a certain declarativeness to writing onclick handlers this time around. But still, I find it funny. Event bindings need to keep track of the view's state to ensure that the events are bound when a DOM element exists (since the only way to bind events is to have a DOM element for it). Here, we are simply taking View.events which is presumed to be a hash of event selectors and their associated callbacks, and using jQuery to attach those events.